Holmes on Homes is a television show in the Home Improvement genre starring Mike Holmes. The tv show first appeared on air on 2001-01-01. Our users found the overall impression of this television show to be Educational. The tv show's official site can be found at www.holmesonhomes.com. 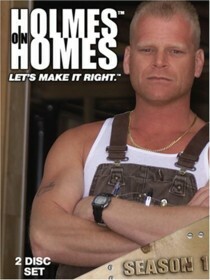 This show stars Mike Holmes, a contractor who is known for rebuilding other peoples shoddy workmanship. The show centers around individuals who have been burned by poor home improvement workers/companies. Each episode follows a particular problem house or project and the viewer watches as Holmes goes through the entire job correcting all the previous builders errors. Holmes also makes sure to point out to the viewer the correct way to do things and what to look out for when hiring someone to do any renovation. This show is quite informative..it can get a bit heavy at times as many of the people on the show have suffered immensely due to shoddy workmanship of others. One case in particular was an episode which starred a lady who was wheelchair bound who could not get around her home as a result of the prior poor contractor. I really recommend this show to anyone who owns a home or is about to undergo a renovation. It will teach you the correct steps to take to protect yourself. This show isn't all serious though Holmes is funny and you will enjoy the antics of the cast and crew.